See how good the XL1 looks in black! The affordable DVCPRO HD camera. 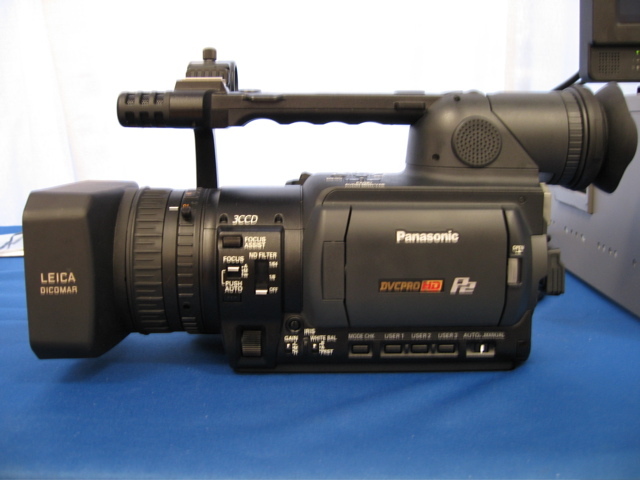 Panasonic was also on hand at this year's Market to further tout their upcoming DVCPRO HD camera for the masses, the HVX200. This may very well be the inexpensive HD camera to beat (if you think $10,000 is inexpensive). I was treated to a two hour workshop of its capabilities and they are indeed impressive. 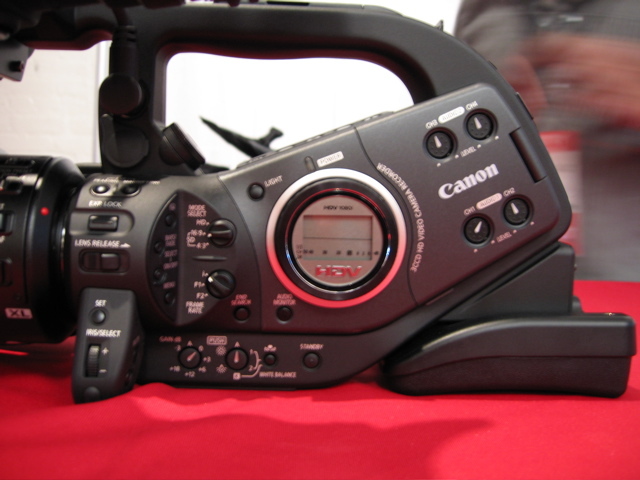 Four times the bit rate of HDV, true 24 frame progressive, intraframe compression, 4:2:2 color space, uncompressed sound, and the expensive, but exciting P2 (SD memory card) capture. Say goodbye to tape! Panasonic promises shipment in December for $9995 retail, which includes two 8GB P2 cards (good for 16 minutes of 1080 recording). 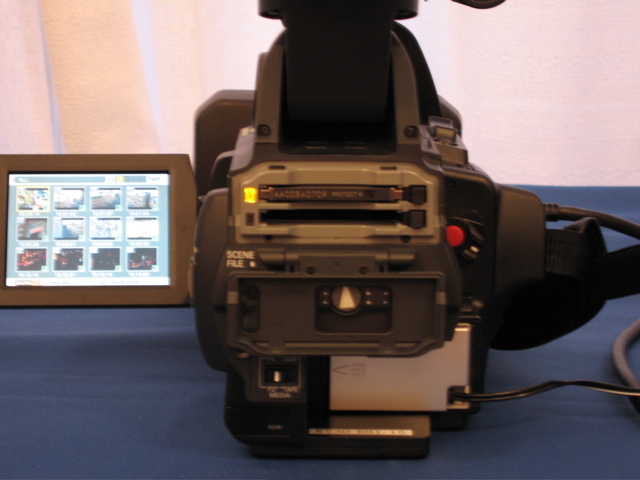 The only working demo in the world was at IFP, but expect to see the final product at DV Expo West. 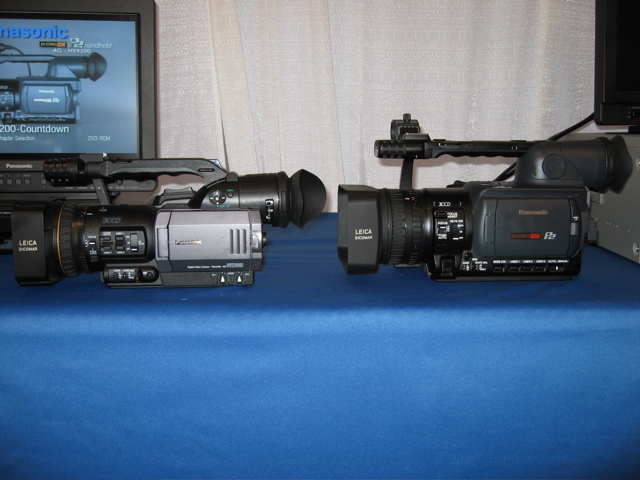 In the interest of equal time, don't forget about Sony's professional HDV camera, the HVR-Z1, which is currently available, and sells for significantly less than the Canon or Panasonic. 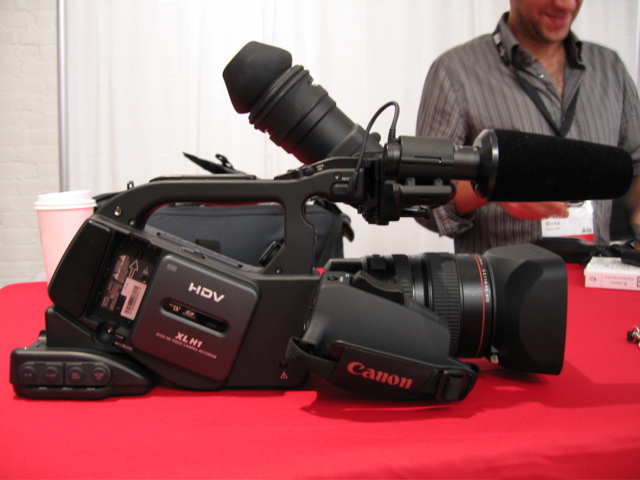 Sony has also just released a new one-chip, "professional" minature HDV camera, the HVR-A1, which utilizes a CMOS, rather than CCD, chip and is literally the size of a stapler and the diameter of a Coke can. Street price is $2,500. SAGIndie rep Paul Bales was also at the Market to explain SAG's new low-budget filmmaking contract, which replaces the Experimental and Limited Exhibition contracts. The new Ultra-Low Budget contract does away with the bump you once had to pay when your project received distribution and the rate for professional actors is only $100 per day. Unfortunately, there is no longer a deferred contract at SAG, but for most low-budget filmmaking situations the Ultra Low Budget contract is an improvement. * Unlike this year's Sundance and Los Angeles film festivals, the Toronto International Film Festival was devoid of no-budget features. More known for their foreign films from top and emerging international directors, and lately, Hollywood's award's season premieres, Toronto has become a hard place to find no-budgets from first-time American filmmakers. 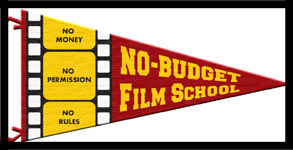 There were some lower-budget features of note, including first-time feature director Aric Avelino's "American Gun", which was shot on Super 16mm by Nancy Schreiber ("November"); "L.I.E" director Michael Cuesta's second feature, "Twelve And Holding"; InDigEnt's newest, "Sorry, Haters"; and the latest from Larry Clark, "Wassup Rockers", shot with the Canon XL2. * Chris Nolan's next project is coming together quickly. Following his successful "Batman Begins", Nolan plans to next shoot "The Prestige" with actors Hugh Jackman and Christian attached to star. Chris' first feature, "Following" was made for $12,000 on 16mm (and finished to 35mm by Next Wave Films). * Craig Brewer's next project is preparing to shoot soon. The "Hustle & Flow" director will be working with producers John Singleton and Stephanie Allain again on "Black Snake Moan" for Paramount Classics. The film stars Samuel L. Jackson, Christina Ricci, Justin Timberlake and recent Emmy-award winner S. Epatha Merkerson. Craig's first feature "The Poor And Hungry" was shot on Digital8 for $5,000. * Joe Carnahan is readying his next directing project for Working Title and Universal. "Smokin' Aces" will star Jeremy Piven, Ryan Reynolds, and Alicia Keys. He is also co-writing the script of director Gavin O'Connor's next feature, "Pride and Glory". Joe's first feature was the $7,000 16mm feature "Blood, Guts, Bullets & Octane", (which also received finishing funds from Next Wave Films). * Marc Forster is attached to direct the remake of French film "36 Quai des Orfevres" for Paramount, following the success of his last feature, "Finding Neverland". His newest film, "Stay" wil be opening soon and stars Ewan McGregor and Naomi Watts. The busy director is also in post on "Stranger Than Fiction" with Will Ferrell, Dustin Hoffman, and Maggie Gyllenhaal. 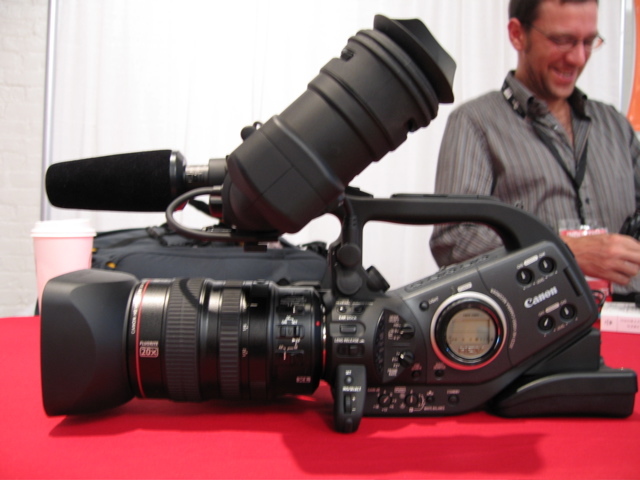 Marc's second feature, the $100,000 "Everything Put Together", was shot on the miniDV Sony VX1000 and premiered at the 2000 Sundance Film Festival. * Justin Lin starts shooting "The Fast And The Furious: Tokyo Drift" this month. The third installment of the successful franchise will star Lucas Black and rapper Bow Wow. Justin's $125,000 feature "Better Luck Tomorrow" was a hit at the 2002 Sundance Film Festival. * David Gordon Green is set to direct "Goat" with producers Scott Rudin and Christine Vachon. David's first feature "George Washington" was shot on 35mm with a budget of $50,000. * J.T. Petty has been hired to write the horror film "Storage" for Redbus. J.T. is also writing and will direct Lions Gate's "The Burrowers," and he wrote the video game for "Batman Begins". J.T. 's first feature "Soft For Digging" was made for under $10,000 on 16mm and featured one word of dialogue, "murder". The No Budget Report - Your NO BUDGET way of seeing the world.